This is an earlier version of a post about consuming a REST service with Angular. A new, fully reworked version for Angular 6+ can be found here. 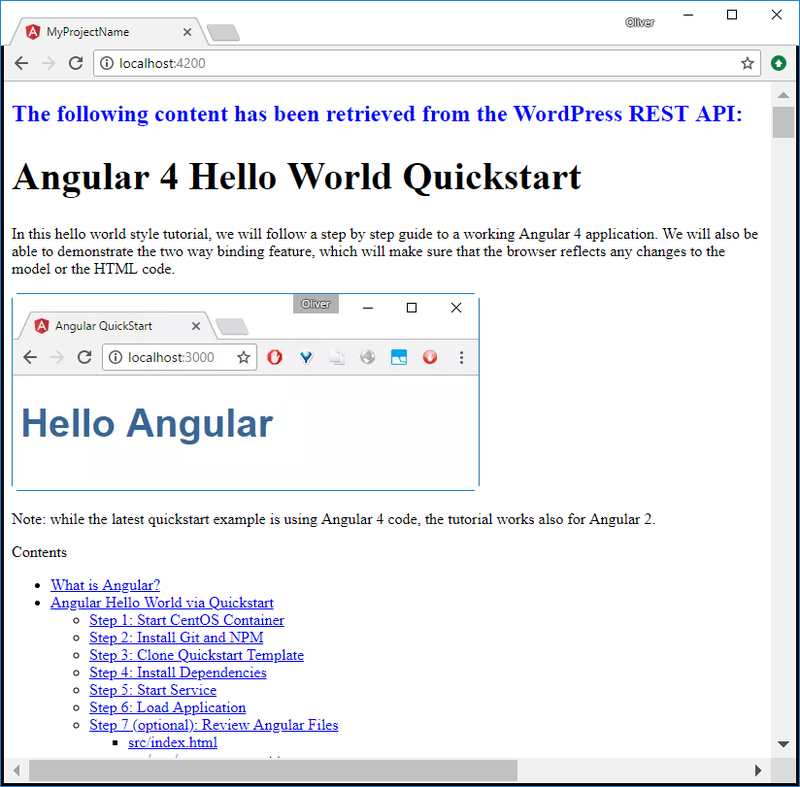 In both versions, I describe how to use angular 4.3+ HttpClientModule. In the new version, I recently have added refactoring stories around service separation and ways of managing subscriptions. We start simple with a working hello world example and work us through by refactoring the code step by step, to reach at a code with a higher maintainability and testability. I recommend using the new version, but some might find it more convenient to start with the somewhat shorter, old version. Click statistics will show. make sure that the HTML content is trusted and fully functional. tested with Angular 6. We are now using pipes similar to the latest Tour of Heros. This time, we will need to use a real Docker host: i.e., different from our last Angular Hello World Quickstart post, this time it is not possible to use Katacoda as our Docker Host playground. We will install Angular CLI, and this requires more Memory than is provided by Katacoda. If you have no access to a Docker host yet and if you are working on a Windows machine, you might want to follow the instructions found here; search for the term “Install a Docker Host”. It describes step by step how to install a Docker host on Virtualbox using Vagrant. I have made good experiences with that approach. For other operating systems, you may want to consult the official Docker installation instructions. Note: the official Docker installation instructions for Windows might work as well, but years ago, when I had started with Docker, the official solution had urged me to write a blog post “Why is it so hard to install Docker on Windows”). Those were the times with boot2docker. However, the situation has improved from what I have heard from other colleagues that have started with Docker more recently. Still, I like the Vagrant approach a lot, and I will stick to that solution. We have mapped TCP container port 4200 to the Docker host port 4200 since we want to access the service on this port from outside. Note: the second command has been introduced recently, since the latest epel-release is missing the http parser library. See SvennD’s blog for more details. Note: the git install command has been introduced to allow the creation of a .gitignore file in the next step. The alternative git installation via curl will install a newer version of GIT, which I prefer compared with the old version that comes with the epel-release. Depending on the speed of your Internet connection, the second command might take some minutes. We can see that angular has generated a v5.2 Angular project in this case. In this phase, we will see, how easy it is in Angular 2 to 5 to retrieve and display data from a REST API. First, we need to tell Angular that we will use the HttpClientModule. For that, we edit src/app/app.module.ts (added parts in blue). Note: since the HttpModule is deprecated now, we have replaced the module by the more modern HttpClientModule. WARNING: sanitizing HTML stripped some content (see http://g.co/ng/security#xss). 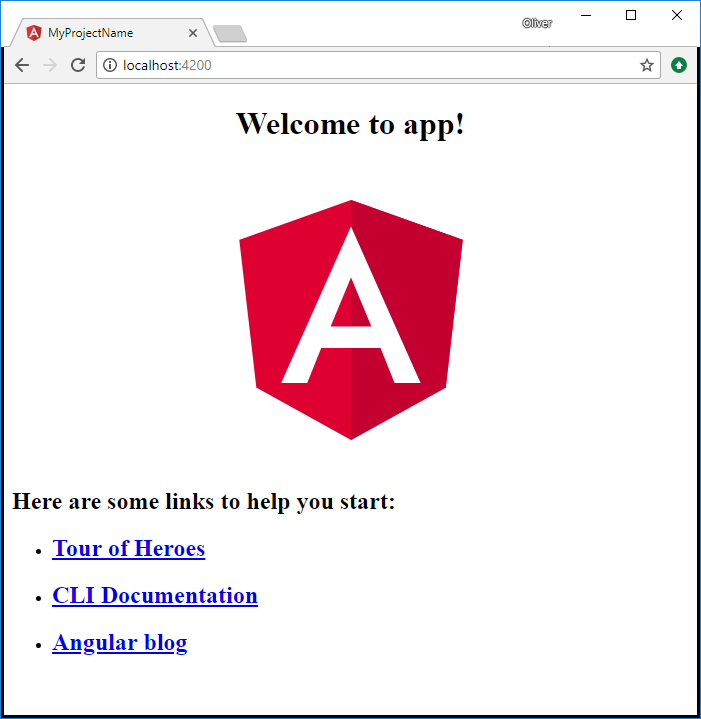 The problem and the workaround is described in my blog post “Angular 4: Automatic Table of Contents – Part 2: Adding Links“. Angular has removed the ID of the span element. Hence, the links to those IDs will not work. 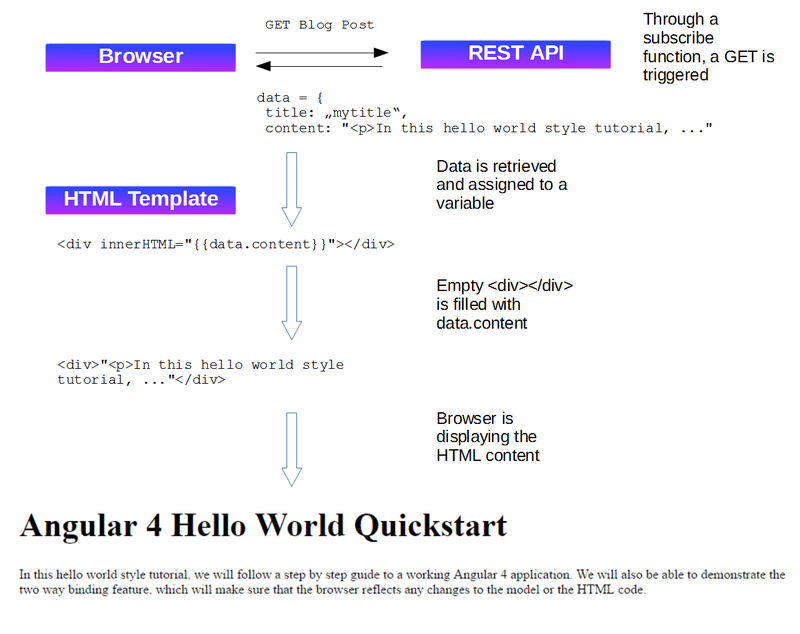 consume the WordPress API for retrieving and displaying a blog post title and HTML content. Retrieve a list of Blog Posts instead of a single post only. The REST client can be separated in its own service like shown in this article. 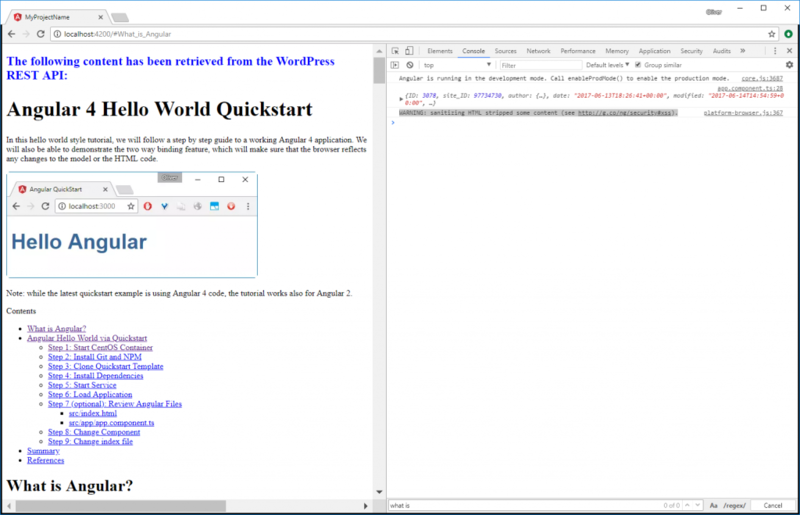 The WordPress API can be explored via the WordPress.com REST API console. You need to login via and your WordPress.com credentials. Because of the organization of the wp/v2 result, we need to exchange data.title by data.title.rendered and data.content by data.content.rendered in the HTML template, though. Note: wp/v2 API does not seem to work with our new primary domain vocon-it.com. We have changed the primary stite from vocon-it.com to vocon-it.com a week ago. See this blog post for a more elaborate Angular 4 REST example promoting end-to-end tests. 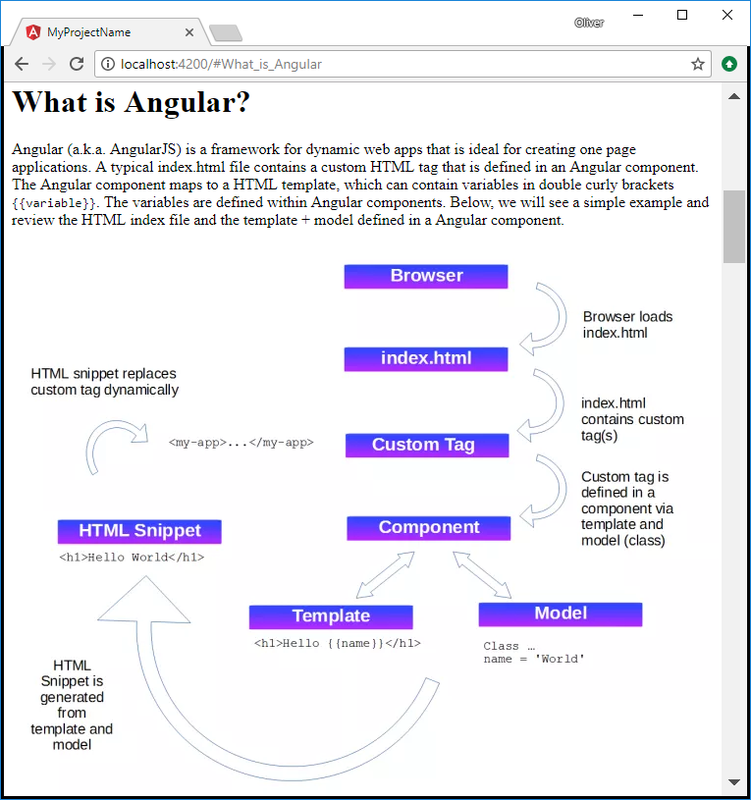 Angular 4: From Theory To Practice: Build the web applications of tomorrow using the new Angular web framework from Google. This free Ebook has helped me to understand some more advanced concepts about CORS and REST.